Entrepreneurship is one of the cornerstones of society in the USA. We celebrate our individuality and perseverance by branching out on our own more often than other places because we believe we can make it. That entrepreneurial spirit is a driving force, but you need more than drive alone to run a business. At CFE, we celebrate entrepreneurship because we recognize that the heart of our communities and economy are small business owners who pour their money, time, and passion into creating something from nothing. They work tirelessly to make their dreams into realities. 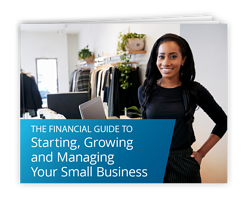 However, dreaming of being a business owner and actually starting, growing, and managing a successful small business are different things. To do the former, all you need is a big idea and the will to work to make it happen. For the latter, you need practical advice and guidance. And that’s what we’re offering in this guide. Fill out the form to download your personal copy!